In recent years, researchers have looked into kelp\u2019s potential fat blocking properties. Because kelp contains a natural fiber called alginate, studies suggest that it may halt the absorption of fat in the gut. A study published in Food Chemistry found that alginate could help block fat absorption in the intestines by 75 percent. In order to reap the benefits of alginate, the research team plans to add the thickening compound to common foods such as yogurt and bread.<\/p>Sea Real Results! Alginate, a natural fiber found in kelp, can help block fat absorption in the stomach by 75 percent. The benefits of sea kelp. Nutrients: Sea kelp is a natural source of vitamins A, B1, B2, C, D and E, as well as minerals including zinc, iodine, magnesium, iron, potassium, copper and calcium. In fact it contains the highest natural concentration of calcium of any food - 10 times more than milk. The National Institutes of Health (NIH) say that seaweed such as kelp is one of the best natural food sources of iodine, an essential component in thyroid hormone production. A deficiency in iodine leads to metabolism disruption and can also lead to an enlargement of the thyroid gland known as goiter. But beware of too much iodine. Over consumption can create health issues, too. The key is to get a moderate amount to raise energy levels and brain functioning. It is difficult to get too much iodine in natural kelp but this could be an issue with supplements. Since inflammation and stress are considered risk factors for many chronic diseases, Stasio Costa says including kelp in one's diet could have numerous health benefits. Kelp is naturally high in antioxidants, including carotenoids, flavonoids, and alkaloids, which help to fight against disease-causing free radicals. Antioxidant vitamins like vitamin C, and minerals like manganese and zinc, help to combat oxidative stress and may offer benefits to cardiovascular health. There have been many claims regarding kelp’s abilities to fight chronic disease, including cancer. Recent studies have explored the role of sea vegetables in estrogen-related and colon cancers, osteoarthritis, and other conditions. Researchers found that kelp can slow the spread of colon and breast cancers. A compound found in kelp called fucoidan may also prevent the spread of lung cancer and prostate cancer. This doesn’t mean that kelp should be used to cure any diseases or be considered a guaranteed protection against disease. In recent years, researchers have looked into kelp’s potential fat blocking properties. Because kelp contains a natural fiber called alginate, studies suggest that it may halt the absorption of fat in the gut. A study published in Food Chemistry found that alginate could help block fat absorption in the intestines by 75 percent. In order to reap the benefits of alginate, the research team plans to add the thickening compound to common foods such as yogurt and bread. Kelp may have great potential for diabetes and obesity, although research is still preliminary. A study published in the journal Diabetes, Obesity and Metabolism found that a compound in the chloroplasts of brown seaweed called fucoxanthin may promote weight loss in obese patients when combined with pomegranate oil. Studies also suggest that brown seaweed may influence glycemic control and reduce blood glucose levels, benifitting people with type 2 diabetes. In addition to its potential to slow down fat absorption in the gut, kelp is low in fat and calories. Thankfully, you don’t need to go diving in the ocean to reap the benefits. Nutritionist Lisa Moskovitz, R.D., C.D.N., C.P.T., recommends that you try to eat your nutrients, versus taking them in supplement form. She suggests including kelp in a balanced diet with plenty of vegetables, from both the land and sea. 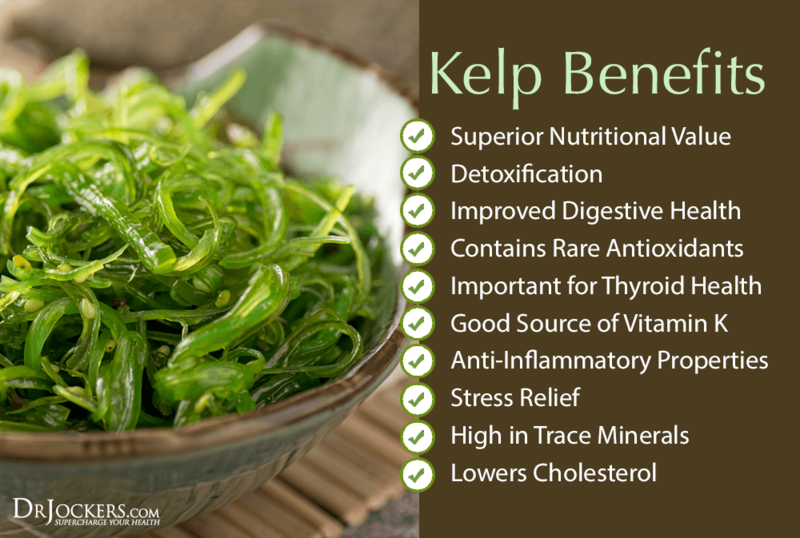 Kelp can be one small part of a broader healthy diet that includes a variety of unprocessed, nutrient-dense foods. Moskovitz says that one of the easiest ways to incorporate kelp into your diet is to add an organic, dried variety into soups. You could also use raw kelp noodles in salads and main dishes or add some dried kelp flakes as seasoning. It is usually found in Japanese or Korean restaurants or grocery stores and can be enjoyed cold with oil and sesame seeds, hot in a soup or stew, or even blended into a vegetable juice.